Wellllll... every week something else comes up that needs doing. Can I help that? Lord knows I’m trying to wrap it up here at Hoe & Shovel and be done with it for the summer. It’s getting too hot and there is already plenty to keep up with around here. That new veggie garden alone keeps me hopping. It’s time to stop with the new projects and move into maintenance mode until fall. 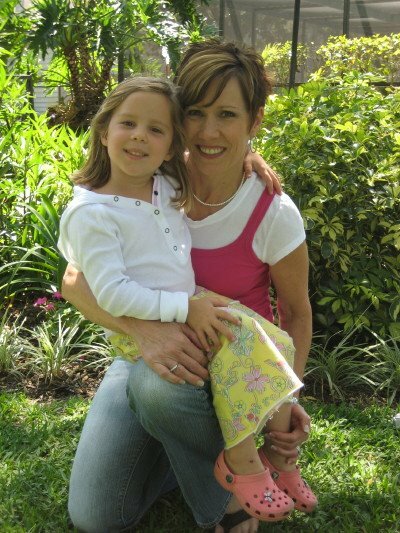 My wonderfully smart and loving children gave me gift cards to the garden center for Mother's Day. (Thanks again, guys- you know just how to make me happy). So there. You see. It isn’t my fault. It was just necessary to make a few more trips to the garden center last week to pick up a few (more) additions. 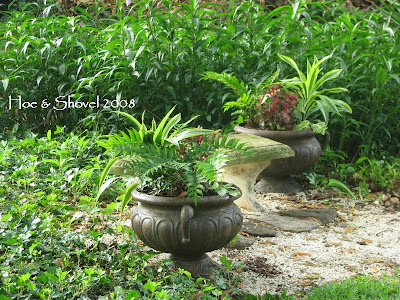 An Australian Tree Fern Sphaeropteris cooperi was added where I dug up a couple of holly ferns to place in some new container plantings (more on that in a minute). I’ve kind of had my eye on this very exotic and tropical looking fern for a while now. Then I realize I am debating with myself about whether I really need to add this now, have I spent too much money already or can I wait until another season and what kind of attention will it need in unfavorable winter weather. Okay, so I've passed up the opportunity to purchase after a few of these episodes. Oh, if only there were points given for this kind of restraint. Then ... there were so many of them at Cypress Gardens in the botanical gardens area looking so magnificent at 5-6 feet tall (with just as wide a frond-span) and their ginormous fiddles poking up through the center … just the sight of them there gave me even more inspiration. They prefer protected, shady, moist conditions but can be grown in sunny areas. There are so many places they would fit right in here at Hoe & Shovel. I chose one about 2.5' tall (and it was on sale) for starters (I'm so tempted to go back and get a couple more). This one settled in quite nicely to its new surroundings already looking like it was always part of the scenery. 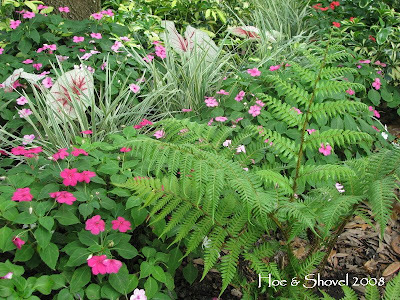 It’s been mentioned many times on this blog how we purposely use as much colored and varied textured foliage as we can among the plantings. It works really well in the tropicalesque design we lean toward here as most every planting bed is under planted beneath large mature stands of oak trees. This creates an almost perfect environment affording dappled shade or you could say filtered sunlight. In the summertime especially, we are most grateful for the natural canopy covering and the mostly tropical plantings appreciate the reprieve from the intense heat as well. Here I’ve added some of my (newly decided) favorite dracaena … it’s called Lemon Lime. Yummy. Why I haven't had any of these before now I'm not certain. Chartreuse color-blends work really well in the shady areas against some of the darker greens of the xanadu, holly fern and the split leafed philodendron I couldn’t live without. 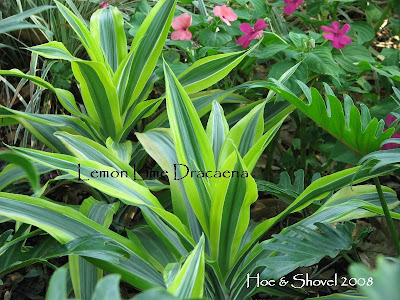 Speaking of lemon lime dracaena... why don't we pop some into some containers while we are at it? Yes, that is an excellent way to add interest and variety to these containers located at the back of the property. 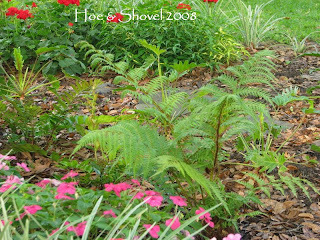 They will be mixed with those holly ferns we dug up earlier to make room for the tree fern. We'll also pop in a coleus with pinks and wine colors and an unknown/un-named pass along pale green trailing vine from an existing container. By adding foliage and not blooms the demand for watering will be lessened somewhat. Two new containers were purchased to replace the three containers holding red new guinea impatiens that used to occupy this location. The impatiens were moved to the front walkway where they won't need as much water as often and when they do ... the water is source is much closer which solves a couple of problems. I'll post later about more container gardens I've put together recently. As a matter of fact, I should do a whole posting on just containers we have so many never featured on the blog. Well this should hold us for a while. Other than the caladium bulbs I'm expecting delivery of in a couple of weeks. We should be finished with new projects until the end of the hot and humid season which is fastly approaching. Don't hold your breath though... I've been saying "this is the last new project" for weeks now. Sighing again up here in Nashville. Meems you bowl me over with your eye for combing colors, textures and leaf shape. Your garden is a delight for the senses. You aren't planning a trip to Leepers Fork anytime soon are you! If I think a plant will disappear from the nursery and possibly not be reordered...I will take it home immediately. Even if it has to sit in the holding area until a home is found...many plants come home to sit out the hot summer in the holding area until fall planting time...So it looks like a nursery at my house! Gail, good morning. You are so kind with your thoughts. Designing and seeing a vision come together is all the fun of gardening for me. I'm not heading to Leiper's Fork anytime soon. My sister is actually coming down here next week. Your holding area sounds like an interesting concept. We don't have that issue here with out garden centers being open all year round and so much to choose from. I do have an area that has started to look like a nursery because of all the propogation I've begun to have fun doing. A cutting of this and a cutting of that growing in my left over plastic pots from the garden center. I'm so glad you got the tree fern! I LOVE them! I was looking at some the other day, wishing they could survive our N FL winters. If I could grow Tree Ferns I would too. I think they are so exotic and beautiful. Yours looks great in place. I also like your planters. I have tried holly ferns here. They didn't do very well. I think our area is a bit too far north even though the tags say they will survive. Not in my garden anyway. I agree with you about the value of chartreuse & green foliage in the shade garden. I can't get enough. Your container combos are wonderful. You have some beautiful colours and shapes in your garden, it really is lovely. I love tree ferns....I have seen groves of them here......normally in a shaded area. They look amazing. We get severe frosts here so I don't know how they would cope with that. I think you have to fill the top with straw in the winter months. Meems you have a beautiful site! I loved the photos and the wealth of information here. 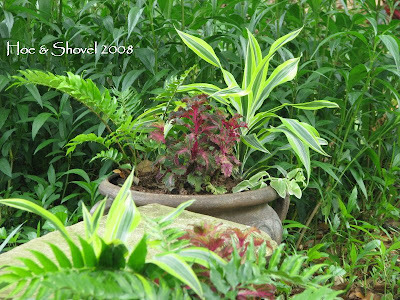 Seeing the lemon lime dracena used with the holly ferns and coleus gave me some ideas for containers. Dracena were common when I was growing up in Miami, but I don't see it very often here in Tampa Bay. Years and years ago, many of my parents dracena plants were stolen by thieves who were working for nursery theft rings, believe it or not. They'd come along with a hack saw and slash the stalk, since it grows from cuttings. Just one more reason why we left Miami. I'll be back, I loved your site! My sister has a large tree fern that is just spectacular. It's on "my want" list too. I agree with you about the color chartreuse. It also goes with any color flower. You just can't beat it. Beautiful containers. Can't wait to see more. ebear*stacy: There are so many dracaena varieties - I have a lot of them - some I don't remember the names but all the varied colors really work well in some of the more massive plantings in my back garden. Thanks for stopping by. Sophie: I'm so tempted to go get a couple more but will restrain until the fall. We've got blue lakes coming out our ears now but I don't mind- I'm even putting them in salads. I forgot to answer your question about my header. Yes, it is the first zinnia that bloomed a few weeks ago. I'm really adoring all the colors. Lisa: those tags can be deceiving can't they? Kind of like full sun- full sun here is very different than full sun up north. MMD: So many helpful uses for foliage - I so love the challenge of designing with it. cheryl: Thank you. We rarely get cold enough here to worry about freezing- and fortunately the tree cover helps out even when we have the threat of frost. Laura: What an odd thing and way to steal. Although I have expanded my draceana plantings quite rapidly by lopping off the tops and poking them in the ground. I'll be doing the same with the lemon lime. Thanks for stopping by Hoe & Shovel. Susan: I'm fairly certain I'm going to be real happy with the tree fern in this setting. 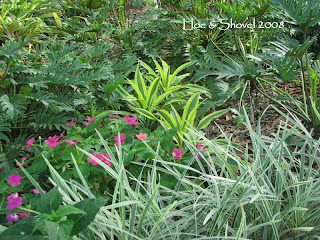 As you know all the colored foliage is especially useful during the Florida summer.